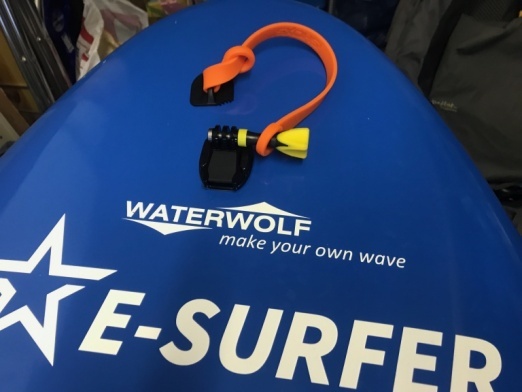 With more an more boards coming to the market let’s have a look at useful electric surfboard accessories. Stuff which makes e-surfing easier, safer and even more enjoyable. 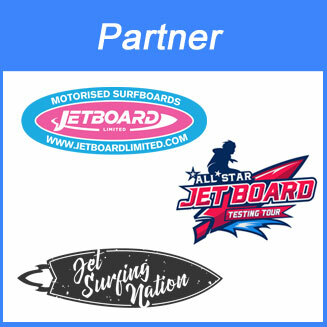 We have tested all these electric surfboard accessories reviewed here ourselves. Protection is 2 fold. Protect yourself and protect your board. If you go beyond 30 km/h the water is getting hard (almost like concrete), but even worth is when you get hit by your own board after a crash. The faster you go the more important a helmet and protection gets. Over 40 km/h a helmet is a must have. A good helmet starts about 90 EUR and a protection vest about 50 EUR. 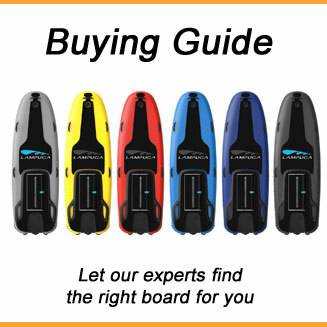 Unless you have an inflatable electric surfboard like the Lampuga Air you may also want to protect your board. The board is very expensive, so you don’t want to have big scratches or even a whole. We chose a nose pumper for 2 reasons. 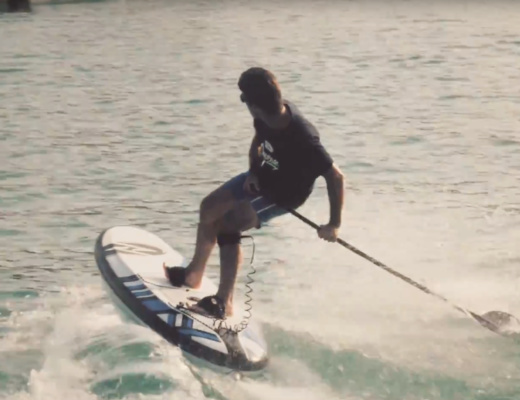 A) it protects your board if you lay it on concrete or if you come to a landing pier and B) it is easier to hold if you transport it on a beach buggy. 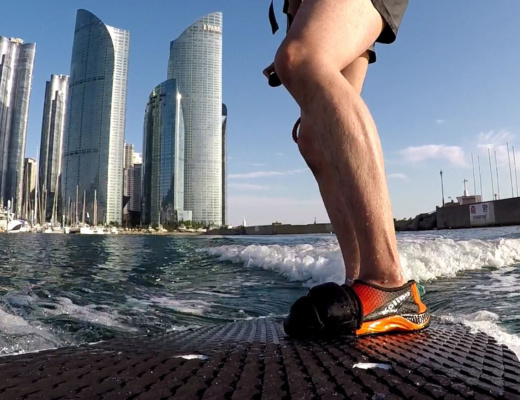 Nose bumpers are originally designed for Windsurfing boards, but do a great job as electric surfboard accessories as well. The one on the picture is pretty expensive with 120 EUR, but there are cheaper alternatives. Or you just build one your own. A waterproof action camera is a good investment for 2 reasons as well. Not only can you capture and share your rides, but the GoPro 6 for example is tracking your speed, location and G-Force. It is always interesting to see how fast you were going. Most of the times you are wrong if you are just guessing. 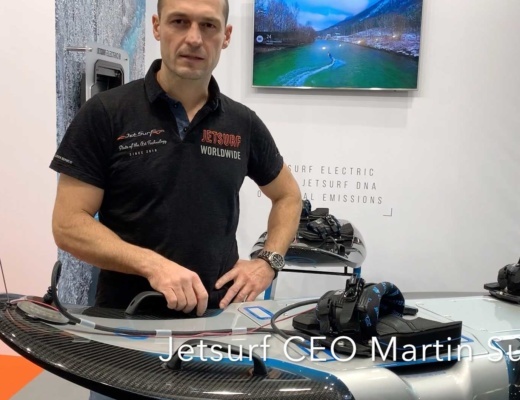 Depending on the brand you pay a few hundred EUR for a waterproof action camera. On top of the camera there are water-sports safety sets available for GoPro and other cameras. 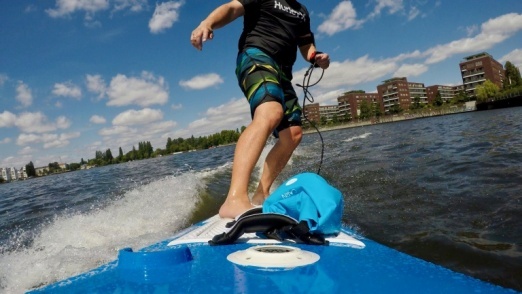 You stick the GoPro holder on your board and than the safety kit provides you a second holder which gets also stuck on the board. The second holder is securing your camera with a small leash. The set is about 25 EUR. 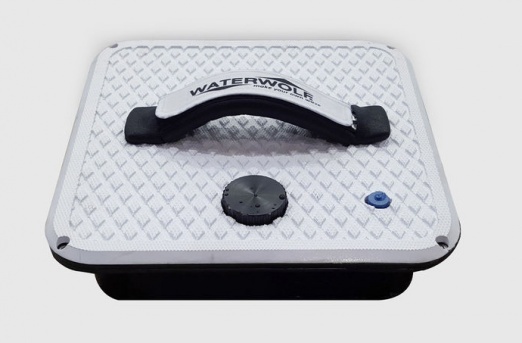 This is about transporting your board and keeping your stuff safe and dry. 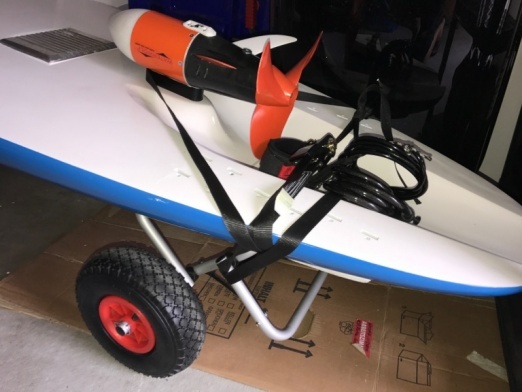 Electric surfboards can be quite heavy and therefore a beach buggy will be very helpful to transport your stuff to the water. 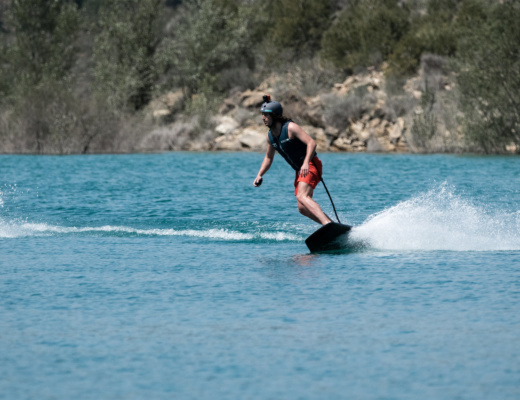 They are popular for any kind of surfboard and are usually around 70 to 100 EUR. So what to do with your mobile phone, keys, id etc. 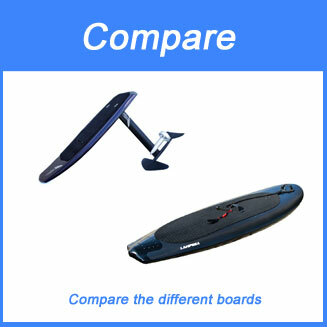 when you are on the water? Just get a small waterproof bag. 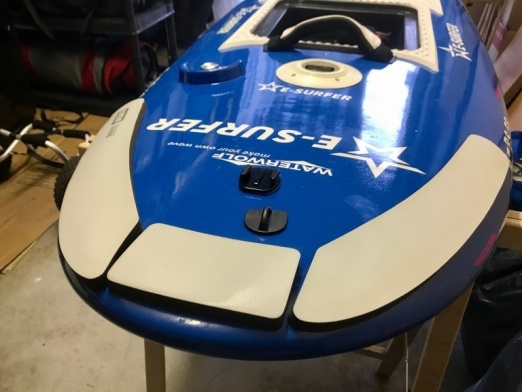 Most electric surfboards have a handle or straps where you can easily fix them. These bags cost just about 15 EUR and we like them a lot. Last but not least the probably most important electric surfboard accessory. 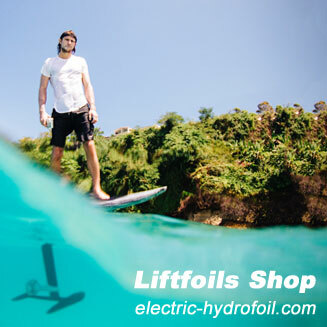 An extra battery is almost a must for every electric surfboard user. You don’t want to stop riding after 20 to 40 minutes. 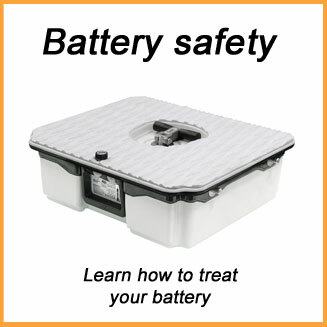 The problem is that the batteries are extremely expensive. 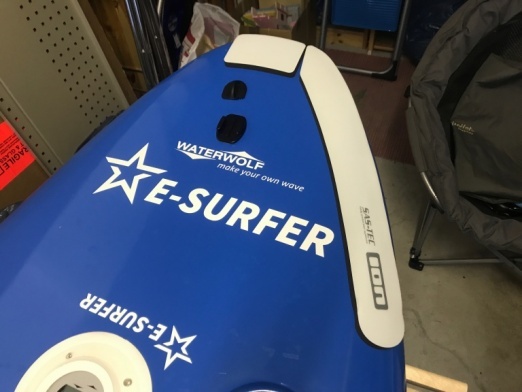 The battery is one of the most expensive parts of an E-Surfer. Depending on the brand you pay a few thousand EUR for an extra battery. 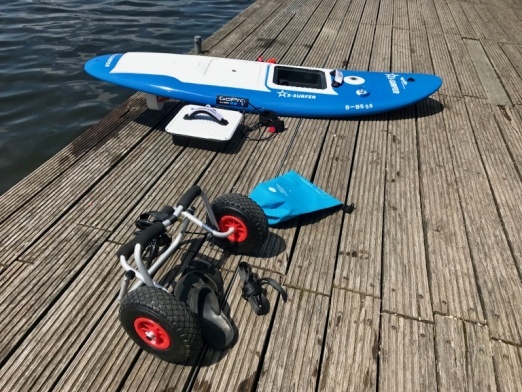 The Waterwolf battery on the picture is good for a 30 minutes ride and is selling for 2,990 EUR. Wow. The new Radinn Powerbox XL which is good for 35 minutes is selling for 4,490 EUR. The prices will go down over the next years, but for the time being this is an very expensive accessory. Do you think we are missing anything here? 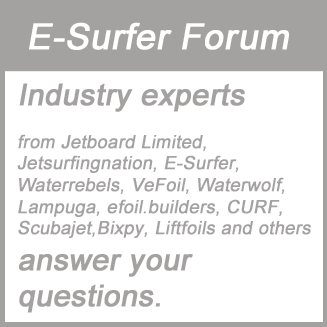 Please share your thoughts in our electric surfboard forum.